Join us for an event UNLIKE NO OTHER as we come together and reunite the PAST and the PRESENT to pray for our FUTURE during the 90th Anniversary Celebration. Beginning Friday, April 5th through Sunday, April 7th, we want to honor God and give thanks for all the families and friends He has brought together through Zion. 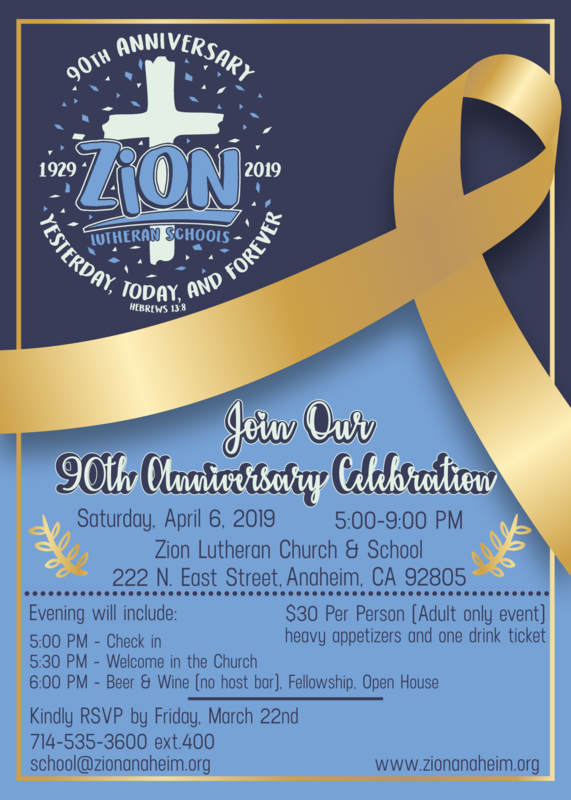 Saturday, April 6th: Special reunion and celebration of Zion's School Ministry (Adult only event). Click here to see flyer. To RSVP for the Saturday event, please fill out this form. We want to hear from YOU! Send in your stories and memories for us to share via social media and in a series of web posts, as we gear up for the 90th Anniversary Celebration. The event will be held the April 5th - 7th, to reunite the Zion families of past and present to pray for the future. To share your testimony, please complete this simple form. you can make a difference. Give today! Not only does your generosity allow us to continue our ministry within our church and school walls, but it allows us to expand our reach far beyond and into our community. From tuition assistance for qualified families to being the hands and feet of Jesus by serving to the less fortunate, your funding and support multiplies and blesses many lives.